House of माउस Ariel and चमेली interaction. Felt like posting this for all आप House of माउस प्रशंसकों out there. Also: Esmeralda background cameo!. Wallpaper and background images in the डिज़्नी क्रॉसोवर club tagged: photo. Yeah. 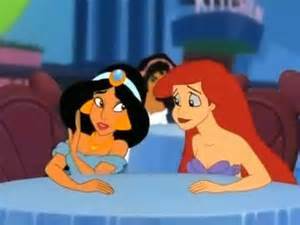 You won't see very many interactions between Ariel and Jasmine nowadays. Only in House of Mouse before it got taken off the air. I just thought I'd add that I totally ship these two!